Dreamed of Living - and the Powerful, Time-Tested, and Proven Skills for Protecting That Life from Anything or Anyone Who Might Threaten It! Learn From Someone Who Has Really "Been There" and Who Knows What You Need to be Successful! Jeffrey Miller is the founder and Director of Warrior Concepts International. His unique perspective blends the needs of his Western students with the timeless wisdom of the Eastern martial arts & enlightenment masters. Beginning his martial arts training in 7th grade, Jeffrey Miller followed his drive to overcome childhood abuses, peer-pressure, and what would prove to be an ever-growing increase in the amount, level of severity, and degree of violence in the Western-world. At the age of 18, after graduating from high school, he volunteered for military service and took his place as a member of the United States Army Military Police Corps. It seems that few people today are willing to do what it takes - to make the necessary sacrifices - to seek out the right teachers and experiences - to follow their dreams and get what they need to express their potential in the world. Jeffrey Miller is such a person. "To teach clients the lessons needed to create the life they've always dreamed of living and the skills necessary for protecting that life from anything that would threaten it." 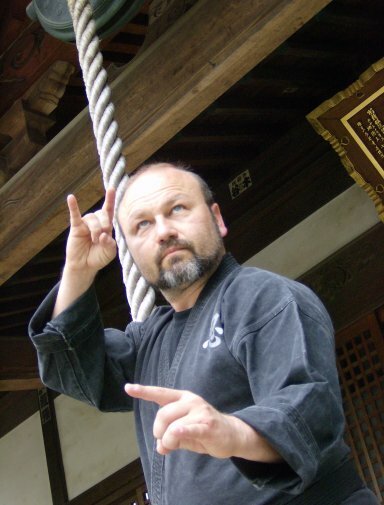 Mr. Miller is a 12th degree master teacher in the centuries old martial arts of Ninjutsu, Budo Taijutsu, and several other ancient armed and unarmed combat methods. He is the creator of the unique EDR:Non-Martial Arts Defensive Training Program, designed for adults seeking "just enough" in the way of basic self-defense as-well-as writer, director, and co-producer of the "Danger Prevention Tactics" video. Drawing on his three decades of study and real-world experience, you can put Jeffrey Miller's knowledge and perspective to work in making your life more safe and secure. Shidoshi Miller is available for seminars, lectures, keynote speeches, and corporate training programs. He offers his unique and powerful perspective, a view that is firmly based in the real-world and easily accessible and usable to Western clients dealing with the problems, stresses, and, yes, dangers of the modern world. Of course, programs and presentations can be individualized for your group or organization. But, if your needs are beyond the scope and abilities of Mr. Miller, he will tell you so. He will never take an assignment for which he is not superbly qualified. Period! Contacting Mr. Miller is easy. Simply use the contact form on this site or call Warrior Concepts International Today at (570) 884-1118 to schedule a telephone appointment. Together, he will work with you to assess your needs and whether or not he is able to serve you. But, you'll never know until you call.